Admit it: You’ve always been intrigued by makeup and have wanted to try your hand at decorating your face just like you saw Mommy do to hers. Day of the Dead gives you permission to paint your face without ridicule, all under the guise of tradition. So go all out. Transform yourself into the glamorous skull boy that’s always been lurking underneath. Celebrate the Day of the Dead as a living sugar skull! This Day of the Dead Male Makeup kit has everything you need to transform your face into a mask of death. If you’re unfamiliar with the holiday and are looking for tips, here are some basics. First of all, the holiday is the first of November, not “Mexican Halloween,” and has traditions descended both from native Aztec traditions and Catholic interpretations brought by Spanish colonists. The Catrina, the name used for elaborate skull faces, shouldn’t be scary––the holiday is meant to commemorate the dead with celebration of their lives, and all the skeleton imagery is to normalize the cycle of life and death. After all, we all have skeletons inside us. What’s scary about that? 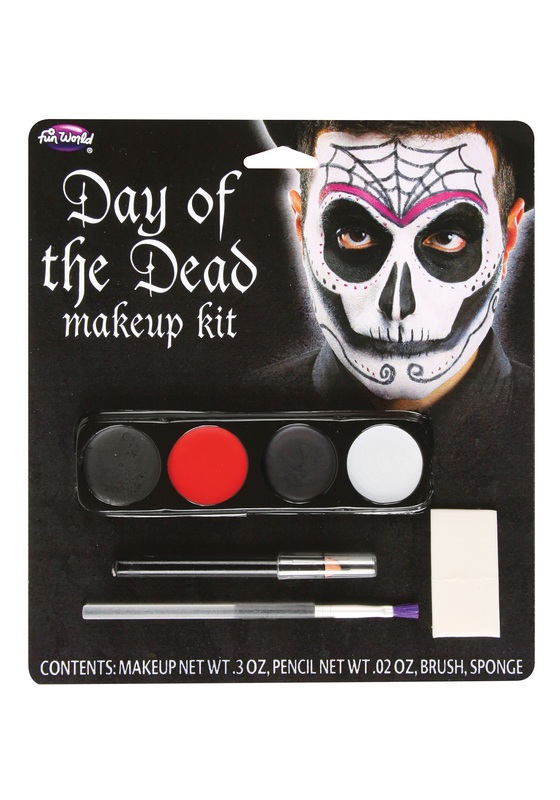 So go all out this Dia de los Muertos with this Day of the Dead Male Makeup kit!